The transport union RMT, its members, and many across the union movement are fuming at the proposed Southern Rail 'deal'. It was made with the leadership of the Aslef transport union and presided over by the Trade Union Congress (TUC) - they and the Tories hope it will settle the Southern Rail dispute. The Tories have bankrolled Southern Rail to the tune of tens of millions of pounds in an effort to try and inflict a serious defeat on the transport unions. Yet the TUC chaired talks which excluded and undermined one of its oldest affiliated unions - the RMT - and, if accepted, would open up unsafe 'driver-only operation' on Southern and potentially across the country. The dog-eat-dog approach of Aslef's leaders hasn't been reflected on the picket lines of their members, who have expressed real solidarity with RMT guards and station staff, who have taken 28 days of strike action. We call on Aslef members to reject this offer and call for more coordinated strikes with the RMT. It is Southern Rail management and the Tories who have been forced onto the back foot by the joint action that has brought the train lines to a halt. Why else have we had Tory MPs calling for a further beefing up of anti-union laws, just weeks before their new repressive and undemocratic Trade Union Act comes into force? This 'deal' has been offered at the same time as the parliamentary transport select committee condemns the government and the franchising of the rail industry. 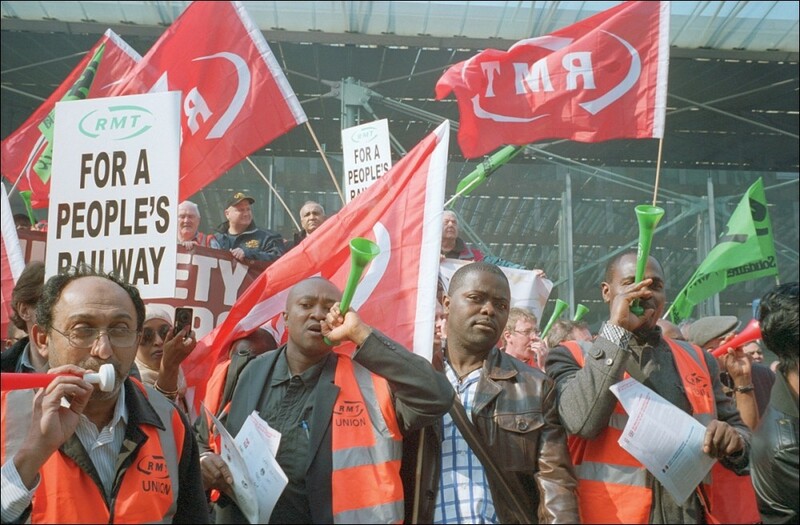 Rather than dividing rail workers from each other, Aslef should be uniting with the RMT to defeat the Tory cuts that will put drivers in the frame for any future accident, and demanding the immediate renationalisation of the rail industry. This has echoes of the 2011 public sector pensions dispute that was ended weeks after the mighty two million-strong N30 strike by a lousy agreement between the Tory-led coalition government and the right-wing union leaders, including Brendan Barber from the TUC. Two of those leaders were knighted by Cameron - many union activists believe for services rendered! Every union member has to stand with the RMT. Send messages of support to the RMT, protest to the TUC, and invite the union to speak at your union meeting. Let's keep the pressure on. Demand from your union that it calls for an emergency TUC general council on the TUC's conduct and then discusses how it can give full solidarity and support to the RMT against the Tory attack.